The girls are shooting in eight directions!! The rules are simple! Be the only one left standing! Move in all eight directions, dodge and shoot! Fight for the illegally strong talismans (items), and turn the tables again and again! 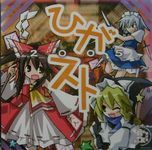 A Shrine Maiden franchise action shooting game.